The service of long-time Hope College assistant baseball coach Ron Boeve will be recognized on Saturday, April 27 when the Flying Dutchmen host Alma for an MIAA doubleheader. 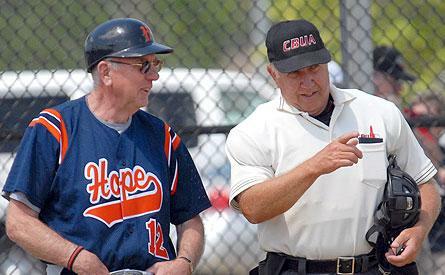 The Hope athletics department has declared it Ron Boeve Day in tribute for his service. This season, for the first time over a span of four decades, Boeve is not pitching the pre-game batting practive or coaching along the first base line at the stadium named in honor of him and his wife Sunny. Saturday's recognition program will occur in between games of the doubleheader. The first game will begin at 1 p.m. Baseball alumni of the college have been invited to return for the event. The Boeves have three children: Sue, a 1981 Hope graduate; Gretchen, a 1986 American University graduate; and Craig, a 1990 Hope graduate. Hope College President Emeritus Gordon and Dr. Margaret Van Wylen on Monday joined faculty, staff, students and friends in celebrating the 25th anniversary of the opening of Hope's Van Wylen Library. The library was dedicated on April 21, 1988 and named in honored of the ninth president of Hope College and his wife.